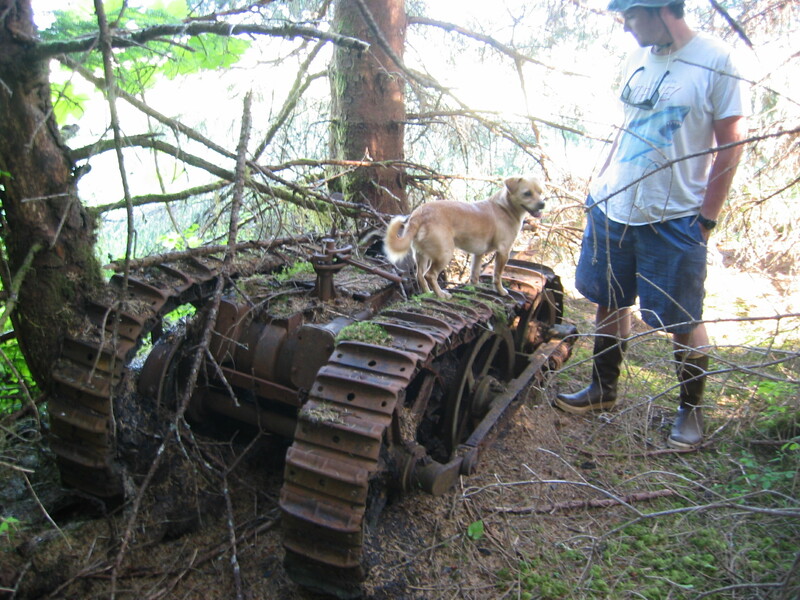 I came across some more photos of derelict machinery at Funter Bay. These devices are in the vicinity of the cannery, in most cases their original purpose is unknown. Unfortunately it is hard to tell the size, but I would estimate it is about 3-4ft tall (with the base buried in the ground). Small steam engines like this had a variety of uses, including small steam launches, and portable power for winches, machine tools, sawmills, etc. 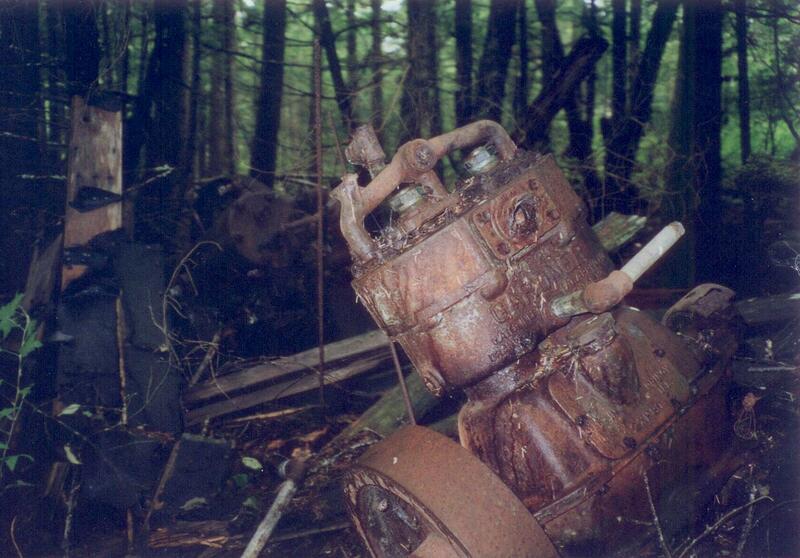 Next is another view of a device found on one of the scows in Scow Bay. It appears to be a small engine or compressor. From what I can tell of the lettering, it was made by Gardner in Quincy, IL and is marked “patent-pending”. The model number at the bottom looks something like 2XF80 or LXB80. This was probably manufactured prior to 1927, when the company became Gardner-Denver. Any machinery buffs reading this are encouraged to enlighten/correct me! Also found at the cannery is a neatly stacked cache of light railroad track. This may have been for a marine railway, a freight tramway on one of the wharves, or some other use in the cannery. 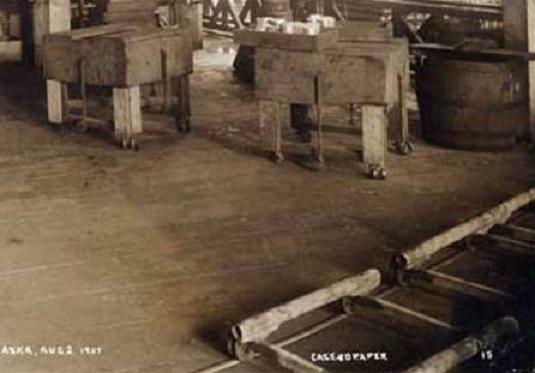 At least one historic photo shows small cart frames riding on tracks at the Funter Bay cannery. 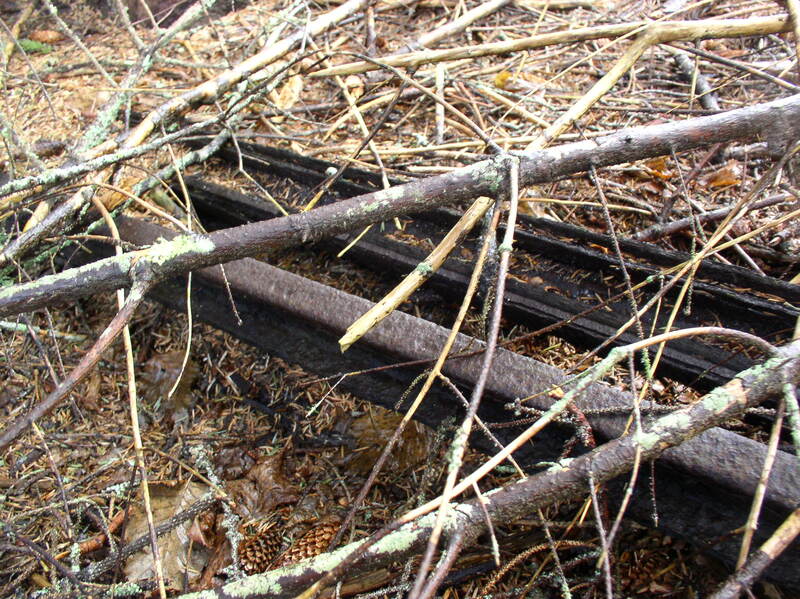 However, the tracks look more like pipes or boards than standard rails. 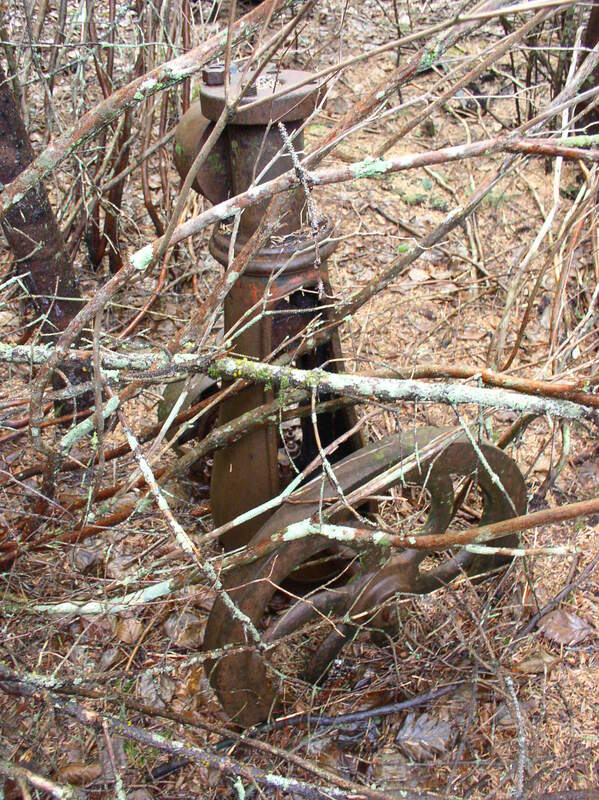 The wheels are double-flanged, suggesting this was one track with no switches or branches. This may have been for loading cases of cans into retorts for cooking, as seen in this photo of another cannery. I have not seen any other photos of rails inside or outside the cannery buildings, although some other canneries had tracks around the property for moving freight and fish. 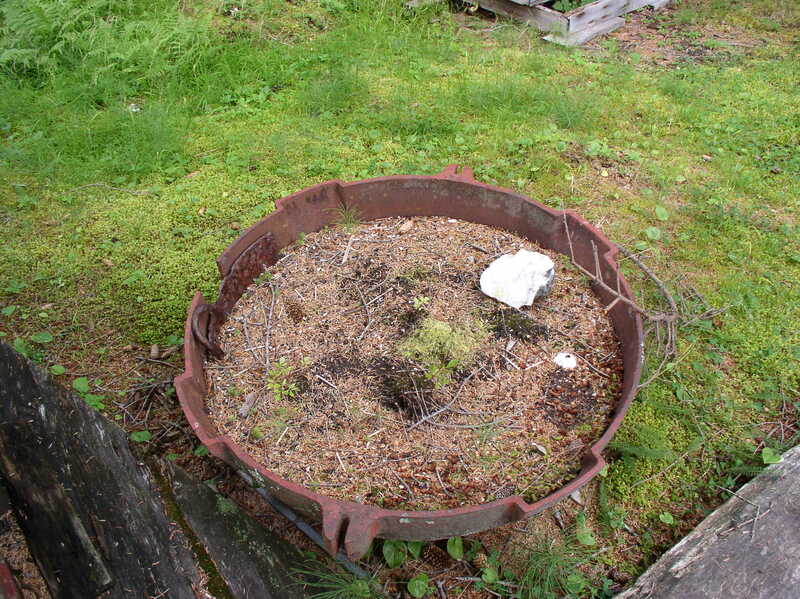 This entry was posted on Wednesday, October 22nd, 2014 at 12:19 pm and is filed under Alaska History, Funter Bay History. You can follow any responses to this entry through the RSS 2.0 feed. You can leave a response, or trackback from your own site. i took that last photo of you and the tractor and the dog. i’m can’t remember which site was the cannery and which was the mining camp, but it was whichever was further into the bay/inlet on the north-west coast. i think it was the mining camp. the cannery was the big thing on the south-east shore right? this tractor was also a little ways up the hill. the map in my mind would let me find it if i was there in first person; the resolution on the maps i can find is insufficient to pinpoint it though.